Wednesday night was our last workshop in the Cooking with Alcohol series. 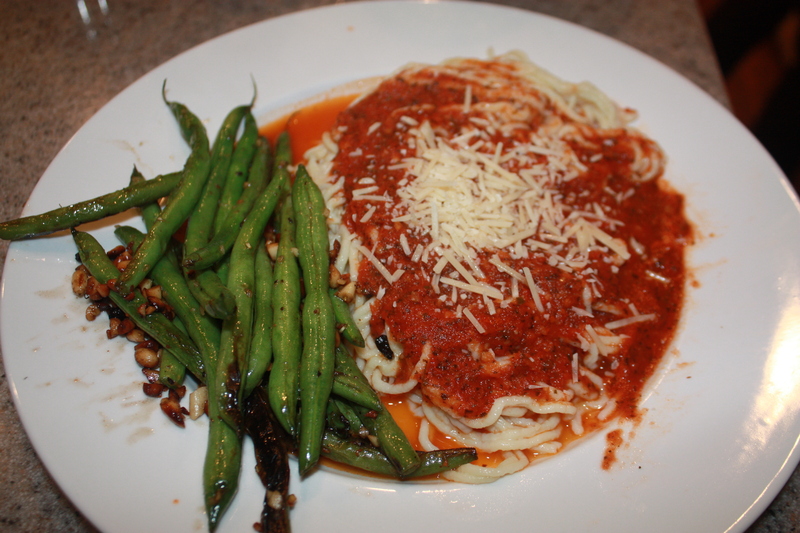 We made a marinara sauce with a gluten-free pasta, accompanied by a salad tossed in lemon/garlic salad dressing and pan roasted green beans in pine nut butter. This marinara sauce is made completely from scratch, but don’t let that deter you. It’s easy to make. We roasted garlic and roma tomatoes tossed in olive oil for about 30 minutes. We then whirled them up in the food processor and added fresh raw garlic, basil, parsley and balsamic vinegar. We used balsamic vinegar instead of sugar to cut the bitter taste of the tomatoes. Sauvignon Blanc white wine was added instead of the red wine typically used. Using white wine gives a lighter and fruitier flavor. Once our sauce was pureed, we added it to a saucepan and let it simmer for only 30 minutes. 30 minutes was enough time to achieve a pretty thick sauce. However, I typically let the sauce cook for about an hour or more to achieve a deeper color and richer flavor. While the sauce cooked, we tackled our gluten-free pasta. Making pasta is an art and test of patience, but it is well worth the effort. I pre-made our dough out of organic cornstarch, tapioca flour and potato flour and added Xanthum gum to give it that gluten-like stickiness that’s in traditional wheat pastas. Eggs were added to finish off the dough. The girls used the pasta roller to make sheets before turning the dough into spaghetti. It took a few passes before we were ready to use the spaghetti attachment. The pasta drying rack came in handy to hang all our noodles on until we were ready to use them. Next, we prepared our lemon/garlic salad dressing with olive oil, fresh garlic, lemon, salt and pepper. It’s a nice, light and healthy dressing. The last dish of the night was our pan roasted green beans with pine nut butter. Although the title says, pine nut butter, there is only a tablespoon of butter which gives it just the right amount of flavor. If you like butter, but want to cut out all the calories, combine butter with olive oil. The olive oil will also prevent the butter from burning. The pasta and marinara sauce turned out perfect. However, I believe the pan roasted green beans stole the show. It’s a simple recipe with amazing taste. Our entire calorie count for the evening was 593 calories! Get ready, our next class will be making light, healthy appetizers on Wednesday, April 9. Looks like this series was a success! Sorry I missed them!